Sturdy and weatherproof, Construction First Aid Kits by North Safety Products are built to withstand hard-hitting construction work environments. These kits are specifically designed to offer you what you need to treat minor injuries encountered on your jobsite. Each kit is equipped with a mounting bracket so that it may be made readily available for emergencies. Need a tough First Aid Kit to withstand the hard-hitting construction work environment? Sturdy and weatherproof, North's Construction First Aid Kits are specifically designed to meet your construction safety needs. Each kit is equipped with a mounting bracket so that your kit can be readily available for jobsite emergencies. Unitized Kits offer cartons that are color coded for you to easily identify, inspect and replenish your kit's individual components. Bulk First Aid Kits offer the same quality components without the color coded cartons and at a more economical price. All Construction Kits are latex-free and meet the requirements of OSHA 1926.50. Construction First Aid Unitized Kits come in 10 unit, 16 unit, 24 unit and 36 unit kits. Construction Welder's and Construction Electricians Kits are also available as unitized kits. Construction First Aid Bulk Kits come in 10 person, 25 person, and 50 person kits. Eye and Skin Flush Stations, CPR Products, Skin Creams and many other products are also available as are many other accessory and replacement products. 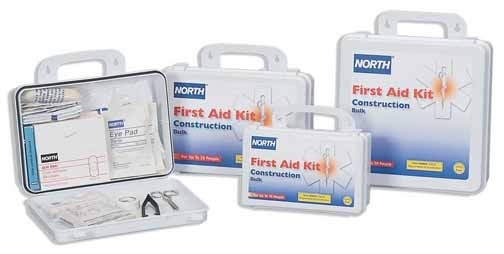 To learn more about North's Construction First Aid Kits and our complete line of First Aid Products, contact us toll free at 888-422-3798, or email us at marketing@northsafety.com.